The Great War was joined in fervor. It had only been a few months, but by December 1914, soldiers of the Central Powers could see the war wasn’t going to be as short as promised. It was the rainy season in Belgium, which reduced the ground to a gluey gray mud; bad enough in itself, but worse for the men digging the trenches used to hide from machine gun fire and artillery. The land was crisscrossed with barbed wire, and the technology of warfare had evolved faster than tactics, making it an extraordinarily brutal war. No wonder why the area between the opposing trenches was dubbed “No Man’s Land”. To ease the fighting men, the British found a way to send their men Christmas boxes, containing food and biscuits, tobacco, and the like, and provided some basic trim for Christmas trees. The Germans did likewise, sending miniature trees and boxes of various items and goodies to the front lines. About this same time, Pope Benedict XV called for a Christmas cessation of hostilities, but both sides refuted his request, labeling it as impossible, and continued planning their engagements. Despite the best laid plans of both armies, a Christmas Truce was on. 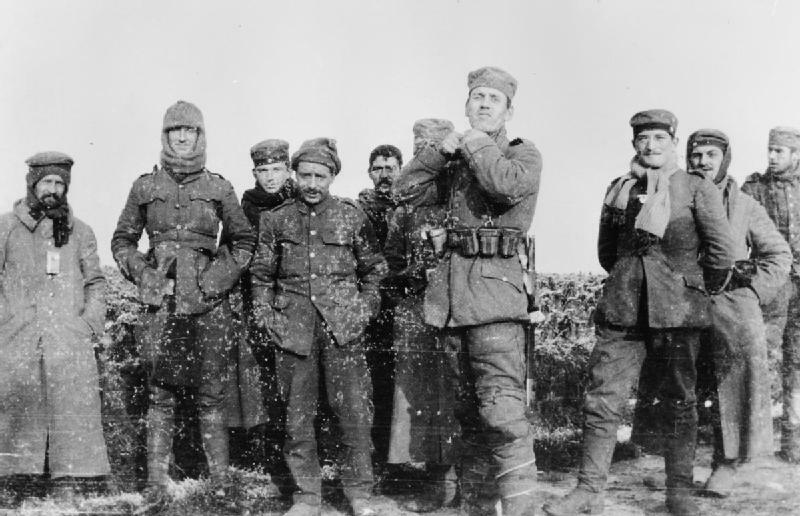 The Christmas Truce of 1914 wasn’t the first spontaneous truce in history, but it was undoubtedly the largest. It wasn’t relegated to enlisted men; NCOs and officers took part. Both sides aided in the removal and burial of dead men in the No Man’s Land, and sang dirges at the services. British, Belgian, French, and German solders took part. There were some notable people aware of, and even tolerant of the truce, including generals on both sides. There were also some notable people against it, including British commanders Sir John French and Sir Horace Smith-Dorrien who vowed not to allow any such unauthorized armistice again (and subsequently ordered heavy artillery strikes every Christmas Eve Hence) and one particular German soldier who though it unconscionable that opposing forces should cease fighting for any reason, and spoke out against it every chance that arose; his name was Adolf Hitler. The truce spread to cover several areas of combat. Some resumed trying to kill each other the day after Christmas, others waited until after New Years. On 21 November 2005, Alfred Anderson, the last remaining veteran of the truce, died in Newtyle, Scotland, having reached the ripe age of 109. Written by Jason Bellows, copyright © 05 December 2005. Jason is a contributing editor for DamnInteresting.com. Edited by Alan Bellows. Last updated 16 January 2017. During the Civil War, these types of truces were not uncommon. In the middle of a battle, occasionally a truce was called, a musical ensemble would head out into the middle of the field and play a concert. Once the concert ended, the group would pack up, head over to its side of the battle. Once they were safely out of the way, the war would continue. (animal and human) and any nourishment was welcomed. War is hell. peace. This war “anomaly” serves to prove that war simply doesn’t make any sense. The good nature of humanity will prevail, or so i hope. I agree war doesn’t make sense, but it is not human’s nature to be “good.” As far as war being hell, it is, hopefully, the closest thing that people can imagine hell being like. Hope cannot be founded in mankind, if so then hope becomes hopeless, because men always fail. Yet having read many of your comments, I deeply respect your point of view. Humans will probably continue to fail as long as the majority of us have some mystical being to blame the failures on and credit the successes to. Hopefully we will move past this type of thinking and realize that we make the conditions that lead to success or failure. i’ve heard about the 1914 truce before and it always moved me. what it shows me is that people can break out of their roboticism and start acting like civilised entities. what perpetuates war isn’t that mankind is inherently evil (i dislike the terms good and evil) it’s because most of mankind has been conditioned to follow orders. the causes of war are kings, priests and politicians. people who are so screwed up i can only feel pity for them. those soldiers in the trenches, both allied and german just wanted to get back to their families and live a good life. except the embittered lousy artist who went on to show that even a nobody like mr. hitler, can comman millions. i think humans are by their very nature compassionate but they’ve had it beaten out of them. there is only one way to stop war. that sounded like a sac episode. I do not think that man is compationate at all, except in respect to self preservation, or self interested compasion. I agree that man wants the the best for himself, still that is self intrested, or ego centric world view. With that statement I must say, that a man put in such circumstance as war, will do the odd thing of coming forward as brother to those who will slay him. Thus, self intrest must take a chance on the “goodness” of others for that sake; that others are just as good as us, and we can be a fraternity. War will not be stopped by anything any man or group of men do. It happens. Still this is a sweet article. They just found an original letter from one of these men to his mother describing this event. I think it is up for auction on Amazon or donated to a museum. It was on Yahoo News source a few days ago (see todays date above), noted as near or on veterans day… The letter was signed “Boy”. Addressed to “Mater”, so I don’t know if this is an English or German expression for Mother. DI, yet sweet. Garth Brooks sings a song “Belleau Wood”, not a 100% true blue rendition, but it inspires hope that peace will come again. Oorah! TO: thisismyseriousside! : THANK YOU for providing the Garth Brooks lyrics to his song. I was not aware this. Excellent!! Oorah! TO: Jason Bellows: THANK YOU for finding and writing about this wonderful story. FYI….While in Marine Boot Camp (Oorah! ), Marine recruits get a healthly dose of Marine Corps history (which, by the way, would make an excellent addition do DamnInteresting.com), of which the battle of Belleau Wood was told frequently. The story about the “Truce” ocurred in 1914. However, there is famous battle which ocurred in the same wood but in 1918. During this battle, the U.S. Marines defeated the Germans; afterwhich the German’s called the U.S. Marines “Teufelshunde” (Devil Dog’s) because of how fierce they fought. Former-Marine said: “afterwhich the German’s called the U.S. Marines “Teufelshunde” (Devil Dog’s) because of how fierce they fought.” Actually, no. After the battle the Marines called themselves “Teufel hunden” which is poor German. There is no evidence they were called this by the Germans. this is one of the most touching and yet saddest stories ive ever read. Can you imagine having to leave a fun party, then spend the next four years killing the other guests in horrible ways? And incidentally the Germans had a name for the Canadian soldiers too. They called them “storm troopers”. The Canadians were at the top of the German watch-list and they generally avoided counter attacking Canadian sections of the trenches because of their tendancy to not fall back. just thought you would like to know. Wishing Peace on Earth and good will towards all mankind. I am reminded of a poster we had in the Vietnam days. It read : What if they threw a war, and nobody came? World peace shouldn’t have to be “managed” with sanctions, threats, and wrangling. It should just BE DONE. To all on this planet I plead for you to lay down the arms & stop dropping bombs. There IS enough of everything on this rock to take care of everyone, plenty of food , fuel and land. Learn to share, accept peace. Quit sacrificing our children to an invisible deity, regardless of it’s name, Allah, Jesus, Muhammad, or God. We are supposed to the highest thinking creatures on this world, so why do we continue to act like ants? If I was commander, I would have ordered my troops to stay armed with small arms and grenades, and at the opportune moment slay the enemy. Cut him down while he is high of spirit and un-alert. Throw grenades into the trenches to blow up their Christmas dinner. Then gut them and impale their heads on sticks, with christmas tinsel all around. Then make sure lots of photos are taken. Forever the world would know the British as the Yuletide butchers. Maybe those coward Nazis would have thought twice. People in olden times weren’t very good at waging war. They were better as cannon fodder. You really have to have absolute disregard for human life to be good at war. Christmas is for suckers and babies. By the way, if you’re 109, you’re far from “ripe”. English makes no sense. Neither does Christmas, which I don’t celebrate. You know what? Humans are the dumbest and least rational kind of people. This is the sort of thing that requires both sides to have a great deal of faith in humanity, or more accurately the opposing grunts. It would have been easy enough for one side to catch the other off guard and have a great big slaughter. It seems like all the soldiers were aware of the other side as flesh and blood people trying to survive under the same conditions without some overriding thirst for vengeance. Or at the very least everyone had some sense of basic decency. And for the record, democracies go to war if and only if a great many people become convinced that some cause justifies massive amounts of death and destruction. And not just leaders who’s careers will end if they alienate their power base too badly.